Insulation – According to the U.S. Department of Energy, 50% to 70% of the energy used in homes is for heating or cooling activities. By properly insulating your home you can create a more comfortable, and consistent indoor climate, while significantly improving your home’s energy efficiency. 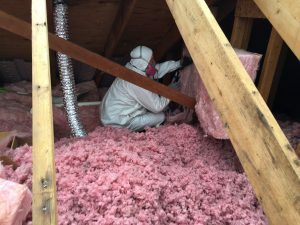 Most homes have insulating material in all exterior walls as well as the attic, and any floors that are located above unfinished basements of crawlspaces. The most effective places to add it to older homes are often attics, basements and crawl spaces. When choosing insulation, one of the most important qualities to note is the R-value. The R-value indicates how well the material resists heat transfer. R-values vary based on the type, thickness, and density. Insulation with a higher R-value performs better than types with a lower rating. Continuous rolls can be hand-cut and trimmed to fit. Rolls are also offered in pre-cut lengths. Available with or without vapor retarder facings. Batts with a special flame-resistant facing are available in various widths. Flame resistant facing is used for basement walls and areas where the material will be left exposed. Fiber is spun from molten glass and sand into fibers. It is an extremely effective material with tiny pockets of air that resist the flow of heat and cold. Fiberglass batts are the most common form of insulation in American homes. They are easy to install and generally the least expensive forms. Rock and Slag wool is similar to fiber glass, but spun from slag and rock-like materials. Often called mineral wool. Mineral wool insulation was among the earliest commercial types. Made from cotton or recycled scrap denim there has been little independent testing done to look at the fire performance and moisture absorption of these products. Very similar to cellulose insulation, these materials require the addition of fire retardant chemicals because they are combustible. Some fire retardants used in these products are know to cause corrosion of pipes and wiring.